Joshua Feuerstein encouraged viewers to call the bakery and and help “expose the hypocrisy” they’re supposedly engaging in. Well, in a parallel of what happened to Memories Pizza in Indiana, Cut the Cake ended up receiving quite a lot of angry messages, including death threats. Sharon Haller, who Feuerstein spoke to on the phone, said, “We started getting some hundreds of phone calls and making very nasty and negative gestures towards our business, towards us.” Feuerstein took down the video at their request, but Cut the Cake posted it online so people could see it, along with a GoFundMe page that has raised, as of this posting, over $2000. Why do I suspect the death threats this bakery received are real since they have police reports to back them up compared with the alleged “threats” that Memories Pizza received. 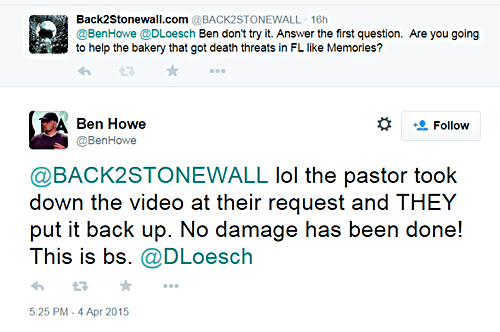 Back2Stonewall .com contacted journalism college dropout Dana Loesch and “pompous bag of hate” Ben Howe of TheBlaze who championed the GoFundMe page for Memories Pizza after they closed their doors because they were “supposedly” getting death threats. And sked if they were going to start a GoFundMe page for the Cut The Cake Bakery in Florida? Right-wing extremist KKK-ristain love and hypocrisy at its best! To my beautiful Gay Brothers and Sisters: James Dobson and Focus on the Family will never agree with you because this inaccurate and false information they spew is their bread and butter. If they did not have a populace to discriminate against, then their REVENUE would greatly shrink. The foundation to healthy living is to protect yourself against their shameful and untrue Evangelical beliefs, for they are dangerous and immoral. Always feel good about yourself my gay brothers and sisters, for I have the experience of internal hate and oppression like many that lasted for many years. I have survived the emotional turmoil that has shaped my entire life, many of our gay brothers and sisters sadly, have not. We must continue the education that being gay is not a learned behavior but a cherished gift from the source of life. Please remember, these religious sinners who are in charge of different faith-based organizations know NOTHING about God, only money and power and they will say, preach or do anything to have it.